The report covers the analysis and forecast of the Airport Ground Support Vehicles market on global as well as regional level. The study provides historic data for 2015 along with the forecast for the period between 2018 and 2025 based on revenue (US$ Mn). The study provides a detailed view of the Airport Ground Support equipment market, by segmenting it based on by Ground support equipment vehicle, application, and regional demand. These types of vehicles are there to provide support and service to the aircraft in between flights. This ground support equipment vehicle generally plays an important role which involves aircraft mobility, ground power operations, and cargo or passenger loading or unloading operations. The current rise in the number of airlines and airports is driving the demand for Airport Ground Support Vehicles or ground support equipment vehicle. It is expected that modernization of Airport Ground Support Vehicles will create a significant demand for Airport Ground Support Vehicles market. Thus, during this forecast period, the Airport Ground support equipment Vehicles market holds a huge potential. Regional segmentation includes the current and forecasts revenue demand for North America, Europe, Asia Pacific, Middle East & Africa, and Latin America. The segmentation also includes the ground support equipment vehicle that can be powered or non-powered vehicle and applications in all regions. Asia Pacific is anticipated to be the fastest growing market for Airport Ground Support Vehicles Market, registering a CAGR of 4.5% over the forecast period. The competitive profiling of the key players in the global Airport Ground Support Equipment Vehicle market across five broad geographic regions is included in the study. These include different business strategies adopted by the leading players and their recent developments, in the field of Airport Ground Support Equipment Vehicles. A comprehensive analysis of the market dynamics that is inclusive of market drivers, restraints, and opportunities is part of the report. Additionally, the report includes potential opportunities at the Airport Ground Support Equipment market at the global and regional levels. Market dynamics are the factors which impact the market growth, so their analysis helps to understand the ongoing trends of the global market. Therefore, the report provides the forecast of the global market for the period from 2014 to 2025, along with offering an inclusive study of the Airport Ground Support equipment market. The report provides the size of the Airport Ground Support Vehicles market in 2016 and the forecast for the next nine years up to 2025. The size of the global Airport Ground Support Vehicles markets provided in terms of revenue. Market revenue is defined in US$ Mn. The market dynamics prevalent in North America, Europe, the Middle East, and Africa, and the Asia Pacific have been taken into account in estimating the growth of the global market. Market estimates for this study have been based on revenue being derived through regional pricing trends. Demand for Airport Ground Support Vehicles market has been derived by analyzing the global and regional demand for advanced telematics in each application for its respective functions. The Airport Ground Support Vehicles market has been analyzed based on expected demand. Forecasts have been based on expected demand from Airport Ground Support equipment applications. We have used the bottom-up approach to estimate the global revenue of the Airport Ground Support Vehicles market, split into regions. Based on ground support equipment vehicle type, application type; we have summed up the individual revenues from all the regions to achieve the global revenue for Airport Ground Support EquipmentVehicles market. The application split of the market has been derived using a bottom-up approach for each regional market separately, with the global application segment split being an integration of regional estimates. Companies were considered for the market share analysis, based on their innovation and application and revenue generation. In the absence of specific data related to the sales of Airport Ground Support Equipment Vehicles several privately held companies, calculated assumptions have been made in view of the company’s penetration and regional presence across all applications. The report covers a detailed competitive outlook that includes the market share and company profiles of key players operating in the global market. Key players profiled in the report include Chevrolet, Cadillac Automobile Company, Pontiac, Ford Motor Company, Mazda Motor Corporation, Isuzu Motors, Mitsubishi Motors Corporation, Honda Motor Co. Ltd., Toyota Motor Corporation, and KIA Motor Corporation. What are airport ground support vehicles? What is the global airport ground support vehicles market size? What is the market driving factors behind the global airport ground support equipment vehicles market? What are the market trends and forecast for global airport ground support vehicles market? What are the global trends and forecasts based on market research and analysis of global airport ground support vehicles market segmentation by component? What are the global trends and forecasts based on market research and analysis of global airport ground support vehicles market segmentation by monitoring? What are the global trends and forecasts based on market research and analysis of global airport ground support vehicles market segmentation by deployment (shadow costing)? What are the global trends and forecasts based on market research and analysis of global airport ground support vehicles market segmentation by geography? Which are the major global airport ground support equipment vehicle manufacturers? Which are the major global airport ground support equipment vehicles companies? Airport Ground Support Vehicles or can be named as aircraft ground support equipment and vehicles. The vehicles transport the cargo or freight and passengers. In airports, this kind of vehicles enable the movement of aircraft and also handles tasks such as aircraft refueling, maintenance and others. The vast range of activities that is associated with ground operation of aircraft leads to an equally vast-ranging fleet of Airport Ground Support Vehicles or ground support equipment vehicle. The tasks include cargo loading and unloading, passenger boarding and deboarding, aircraft refueling, engine maintenance and fuselage examination, potable water storage to name a few.. Specially designed GSE or Airport Ground Support Vehicles are employed to support all of these operations. Airport Ground Support Vehicles the Airport Ground Support Vehicles market has been growing at a healthy pace over the years due to increasing number of airport development projects around the world. The recent rise in number of airlines and airports is driving the demand for Airport Ground Support Vehicles or ground support equipment vehicle. Thus, the Airport Ground Support Vehicles operation is expected to augment the market growth during the forecast period 2016-2025. Major applications of Airport Ground Support Vehicles market covered in the report are passenger, and freight or cargo. The report has been segmented by ground support equipment vehicle which is further categorized into two parts such as powered vehicles and non-powered vehicles. 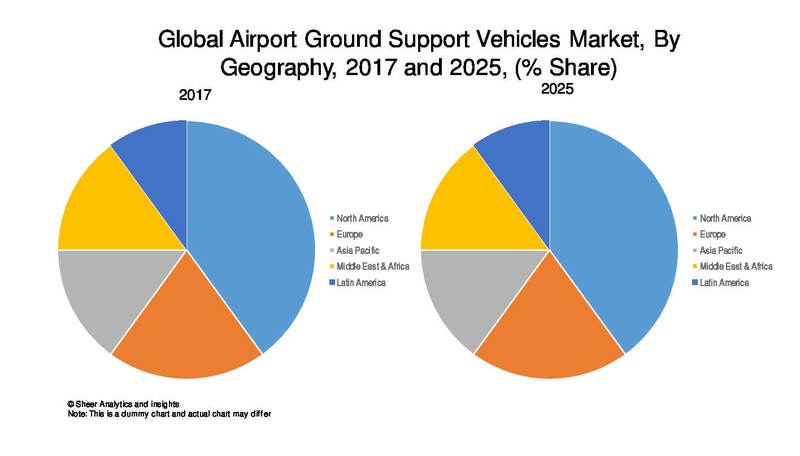 The global Airport Ground Support Vehicles market has been further segmented geographically into North America, Europe, Asia-Pacific, Middle East and Africa and Latin America. Airport Ground Support Vehicles market has been on a growing stage throughout the forecast period. Major factors for the increasing demand of this market is the rise in demand for electric and hybrid Airport Ground Support Vehicles and along with this the increasing number of airports across the globe. Transformation in the Airport Ground Support Vehicles market has led to an efficient way of operation. According to the recent market trend, the passenger segment based by application type holds the largest market share. In the coming years, the increasing uses of warehouse operations and storage systems have a positive impact on Airport Ground Support Vehicles market thus augmenting the growth of this market. Moreover, another major factor is the evolution of Low Cost Carrier (LCC) airlines which is expected to enhance the market growth during the forecast period 2017-2025. With the increase in freight traffic and passengers, the frequency of aircraft movements is also increasing, due to which it is expected to witness an increasing rise in demand for commercial Airport Ground Support Vehicles to support ground operations. Additionally, modernization of Airport Ground Support Vehicles is also expected to intensify safety measures and also the efficiency of airline operations. Some of the major players in the Airport Ground Support Vehicles market are Chevrolet, Cadillac Automobile Company, Pontiac, Ford Motor Company, Mazda Motor Corporation, Isuzu Motors, Mitsubishi Motors Corporation, Honda Motor Co. Ltd., Toyota Motor Corporation, and Kia Motor Corporation among others. 13.8 HONDA MOTOR CO. LTD.